The Serene Organic 8" Memory Foam Mattress provides cloud-like comfort with the support you need. Three layers combine to cradle the body comfortably, support it, and dissipate heat for that perfect night's sleep we all crave. Say goodbye to pressure-point pains or tossing and turning trying to find that cool "sweet spot" on your mattress. Not only does this mattress have everything your body needs for restful, recooperative sleep, it is also made from palm-base, environmentally friendly materials that are sustainable and renewable. This is the ideal mattress for the modern working person who does not mind helping out the environment. Mattress Special! For a limited time, you can save 5% off a select bed or bedroom set by purchasing it with this mattress. For our catalog of eligible beds and bedroom sets, click here and follow the instruction on the product's page to receive your savings! This product arrives very tightly packed. Please unwrap and allow 24 hours for this product to return to its original shape. This product is under warranty for a period of no more than ten (10) years from original purchase. 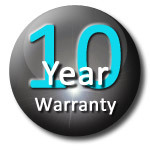 This warranty covers any manufacturing defect found during this period. If this product is determined to be defective during this period, we reserve the right to replace or repair this product. We also reserve the right to substitute models or materials of comparable quality. The repaired or replaced product will be returned to the purchaser at the purchaser?s expense, however, all transportation costs will be covered by the manufacturer within the first year of ownership.